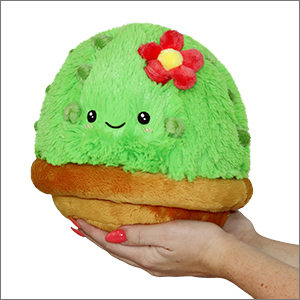 Mini Squishable Cactus: An Adorable Fuzzy Plush to Snurfle and Squeeze! Kristel G. I'm a 3D Artist. I love plushies and hedgehogs. Why do all of my plants meet an untimely end? Even the "fool-proof" ones: apparently they haven't met this fool! Air plants, spider plants, succulents, cactuses, it doesn't matter. If it's green, it will soon be brown. My mother loves cacti and I usually get her one for holidays and this time I decided to get her a cactus she could actually love and physically show her love! I loved buying this and she loves it. The details and colors are on point! Highly recommended. I got Prickles as a gift for Christmas and she is an amazing Squish! She's so soft and adorable. I was so excited to unwrap her. She made such a wonderful gift. Found this little cutie in a souvenir shop in Arizona. I didn't expect to buy this, but completely fell in love! My cactus is so squishy and soft (like all squishables) but it's a perfect size to hug or even use as a pillow! Such a great buy! !